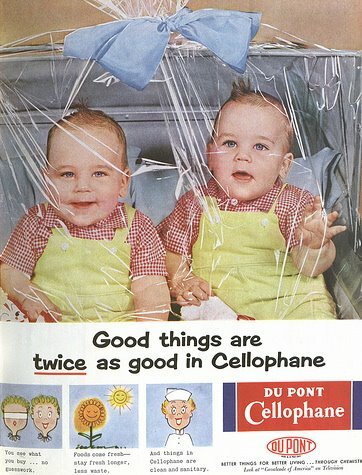 The 1950s were a simpler time, but mostly because most sets of twins suffocated long before they could grow to become problematic. And here I thought Betty Draper’s reaction to her daughter playing in a dry cleaning bag in the first season of Mad Men was cartoonish and unrealistically casual. recent narrative of inventive infanticide here at the Cereal Box. ed. : word verification just now "manglys." ew. S: I would like to say that I broke out of this trend, but the post subsequent to this one stars a man-eating flower, drawn by a child. J: This is amazing. I think I've seen it before, but I'd forgotten about it until now. Hilarious.